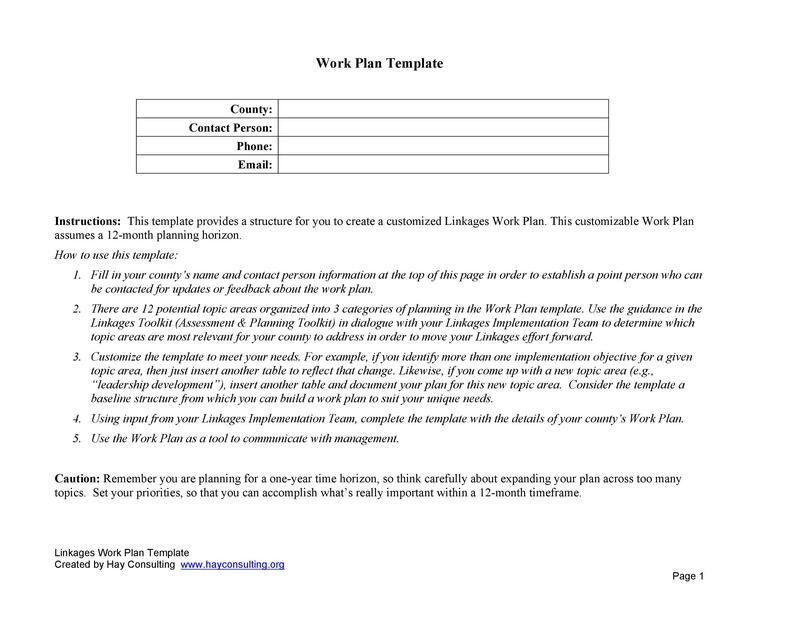 Work plan templates are usually made for projects to make them more organized and efficient. They should display all the activities and tasks which are involved in a project, who is assigned to each activity and task and when the tasks are supposed to be completed. 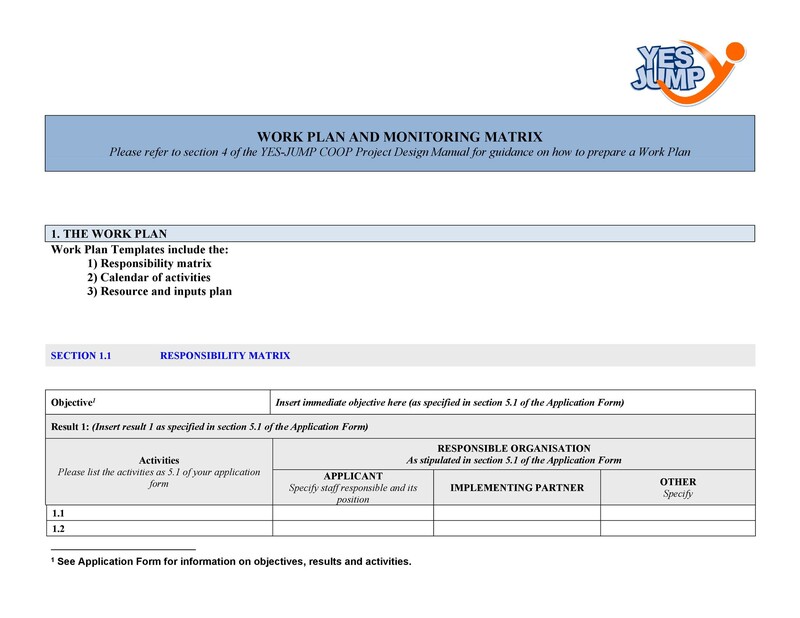 Usually, these plans are made as part of the requirements when submitting a proposal for a project. Once the project has been approved and has begun, the plan would then serve as a tool to keep track of the project and check if there are no delays. 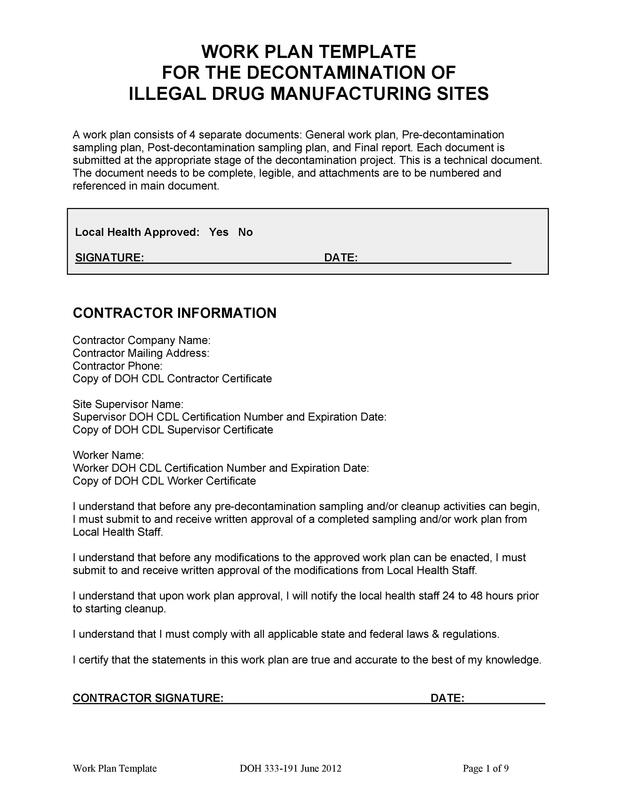 This article is all about this document, of the different types, benefits, components, and even how to make your own template. Read on and be guided by all this useful information. 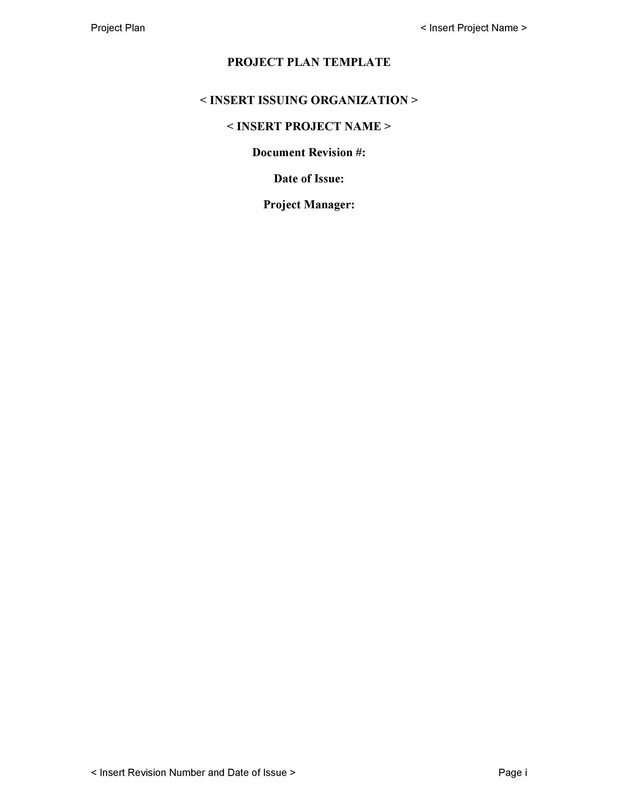 These plans are extremely useful for small organizations and businesses wherein only a few people would be given tasks to complete for the project. 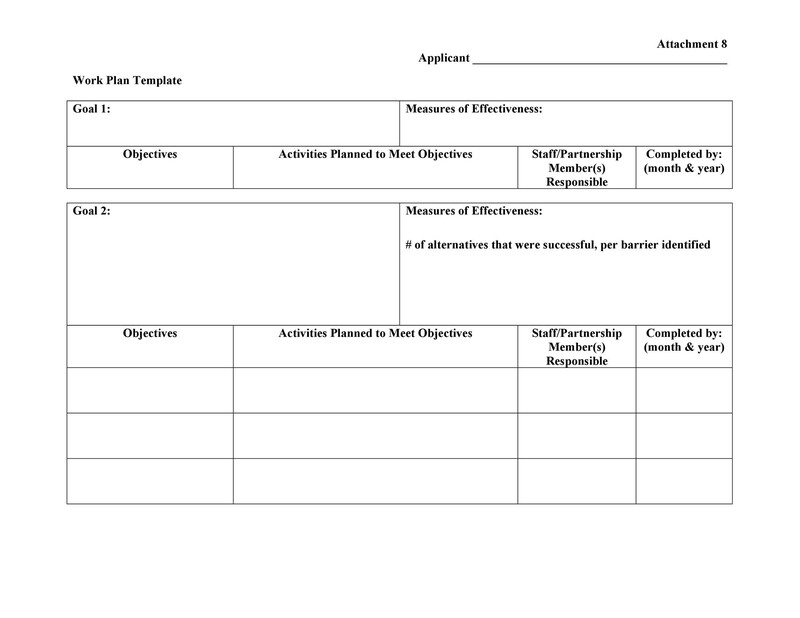 Typically small business owners would assign employees with creating individual plans for different projects such as launching a new product or even for strategic long-term planning. These plans can also be used if an employee would like to approach the owner of the business or organization with a proposal for a new project. 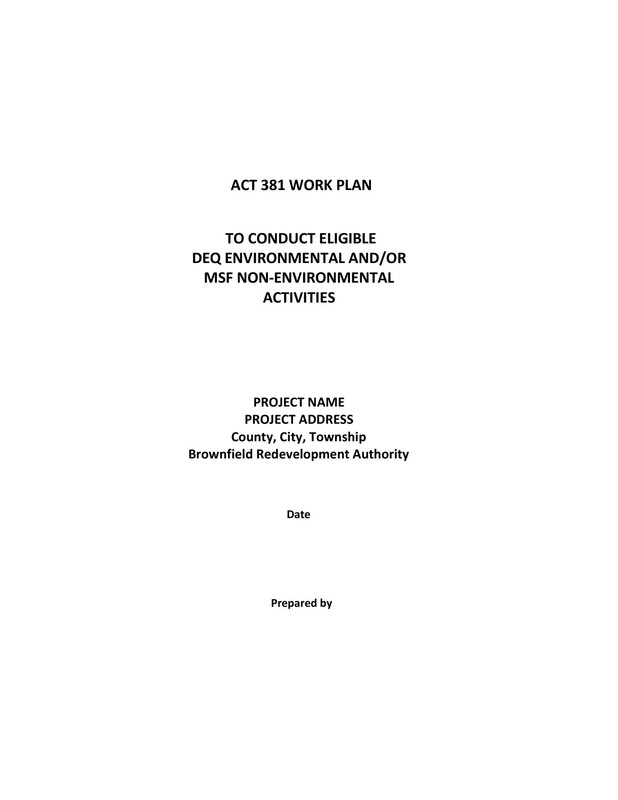 Then the plan should be very detailed and should include all necessary information and attachments to be approved. 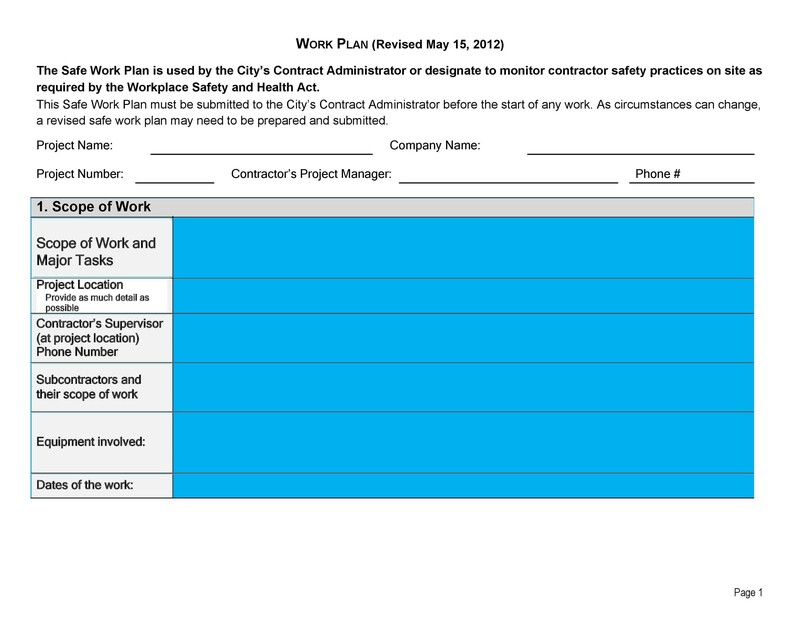 This type of plan is very much similar to one for employees except that it has a larger scope and it would usually involve a whole department or a team of employees. This plan would detail who is assigned for the different aspects of the project or the proposal and would focus mainly on the benefits it would have to the company. It is frequently more detailed in terms of finances which mean that it would take into consideration the budget which is already existing, it would show any projection of costs and resources as well as the possible outcomes when the project is implemented. 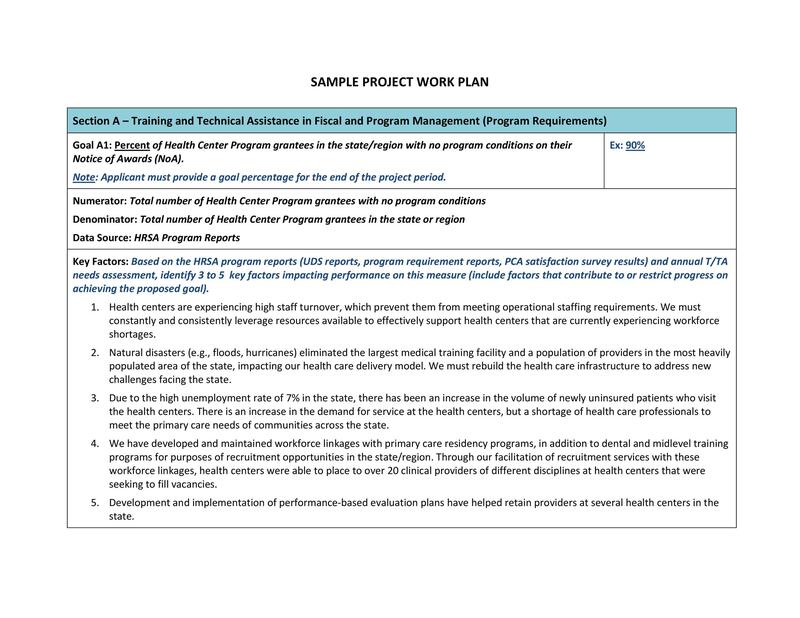 This type of plan would be similar to a simpler version of a business plan and it would generally contain the same components as plans for employees and managers. However, it should also contain relevant market research as well as long-term projections for costs. This type of plan can be used as a tool to bring up the probability of new projects to key people such as the members of the board, stakeholders and potential business partners and investors. If a business owner would like to introduce the idea of a new product or a new project would be very beneficial to the business in a board meeting, then he/she could make such a plan to aid in his/her presentation. 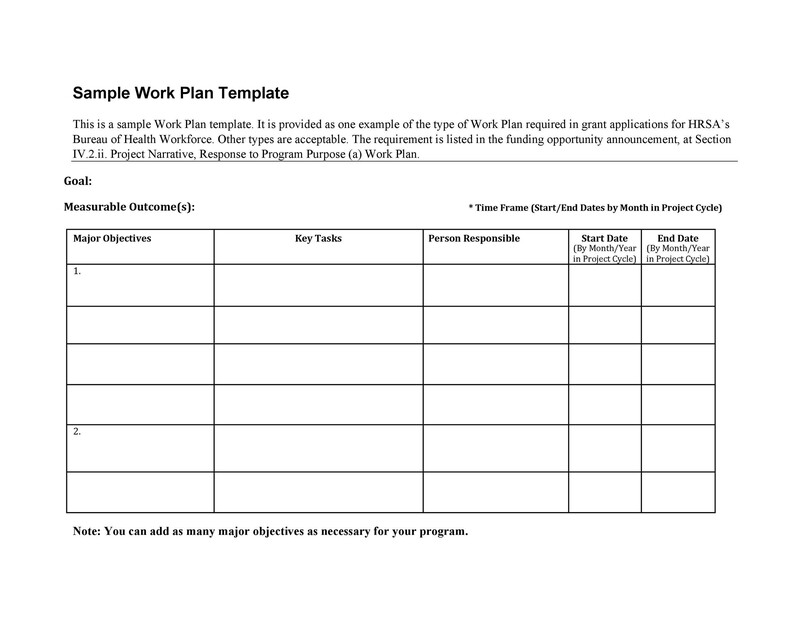 These are the most common types of plans which can be made. So before you make yours, think about the purpose of your plan so you can determine which one you will be creating. Now let’s take a look at the different benefits of making and using such plans. 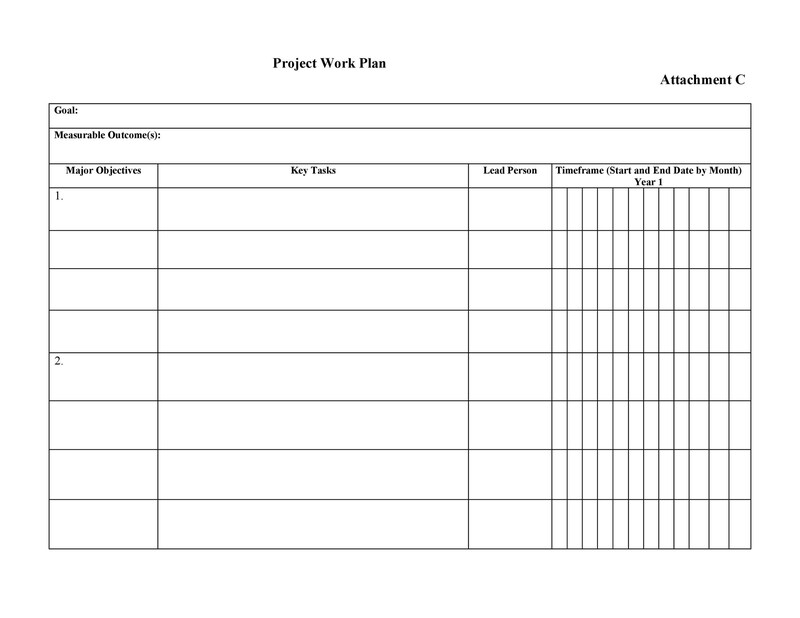 Whenever you plan to make a project, a project work plan template would usually come with it. But is it really important? As you would see in this section, there are quite a number of benefits to making and using such a plan. These benefits would work towards the betterment of your organization so it would be good to know about them. 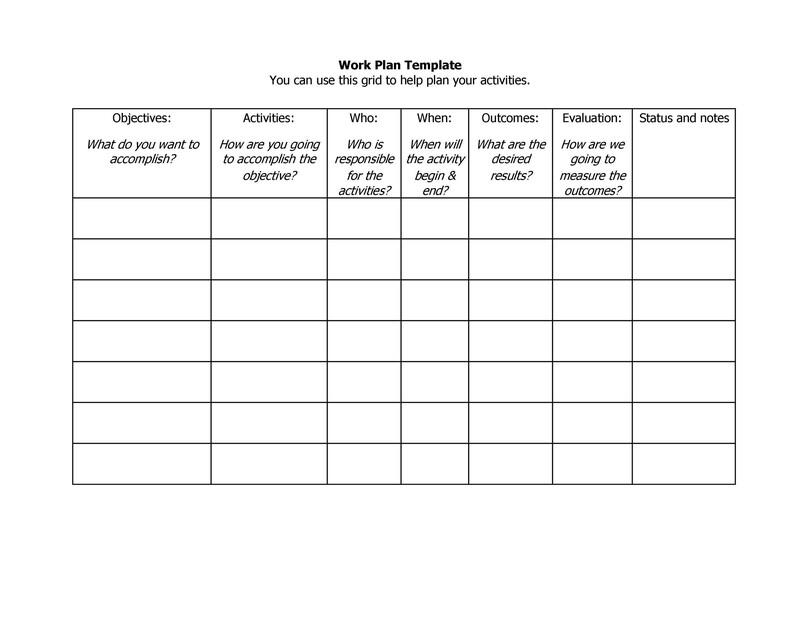 When you make an effective and organized plan, you could use it as a tool to monitor the progress of your project. As you are accomplishing objectives by completing tasks, you would be ticking off these items and as you are doing this, you will clearly see how you are getting closer to reaching the goals of your project. This could serve as a great motivation for you and your employees especially when you see that things are getting done and the goals are within reach. 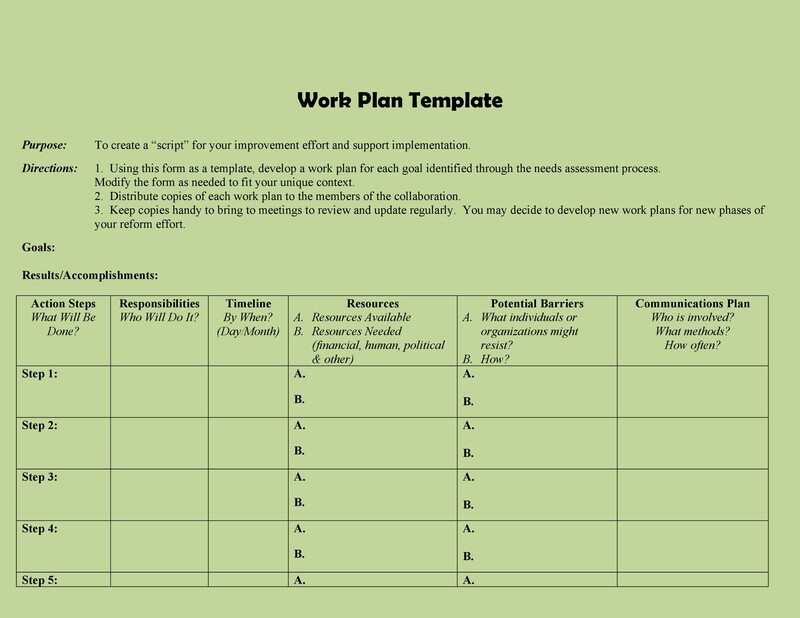 Making a plan wherein all tasks are clearly defined and designated would help improve the communication within the group of employees who would be working on the project. If everyone is on the same page and everyone is working towards the same goal, it would mean that no one is confused and the project will most likely progress smoothly. 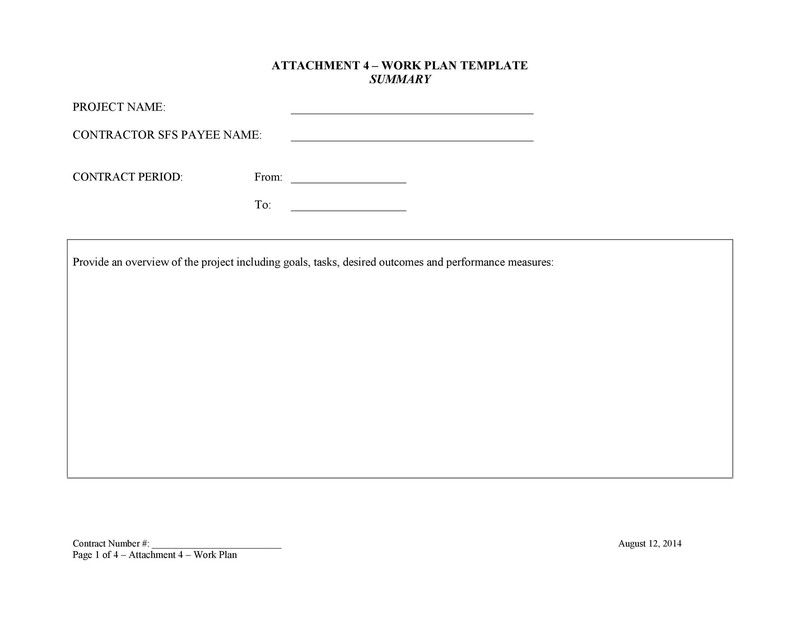 Having a well-made plan would permit you to manage the costs and budget of your project more effectively. Since you would have to include the budget of each task and the whole project, you would have an idea how much you are expected to spend for each activity. Do your research and include all the estimates in your plan so that you would be able to keep it under control. Since part of creating your plan is to think about possible limitations and constraints, you would most likely be prepared when they happen. You would have a plan of action and space in your timeline to make up for the unexpected occurrences and so your project won’t get too delayed. As you can see, there really are a lot of benefits to making such a plan. Now before we move on to actually making one, let’s take a look at the different components which should be included. No matter what type of plan you are making, these components should be present which is why it’s important for you to be aware of them. 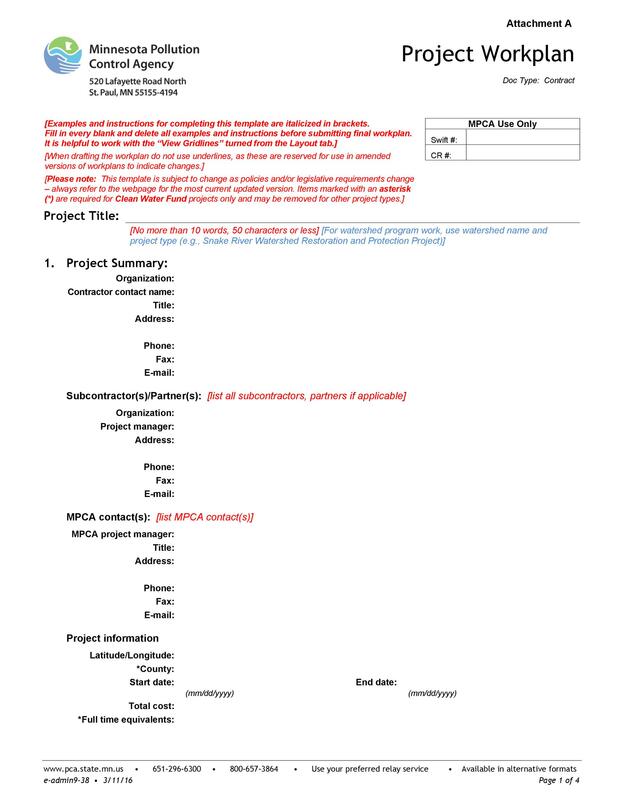 The very first component of your plan should be the project description. 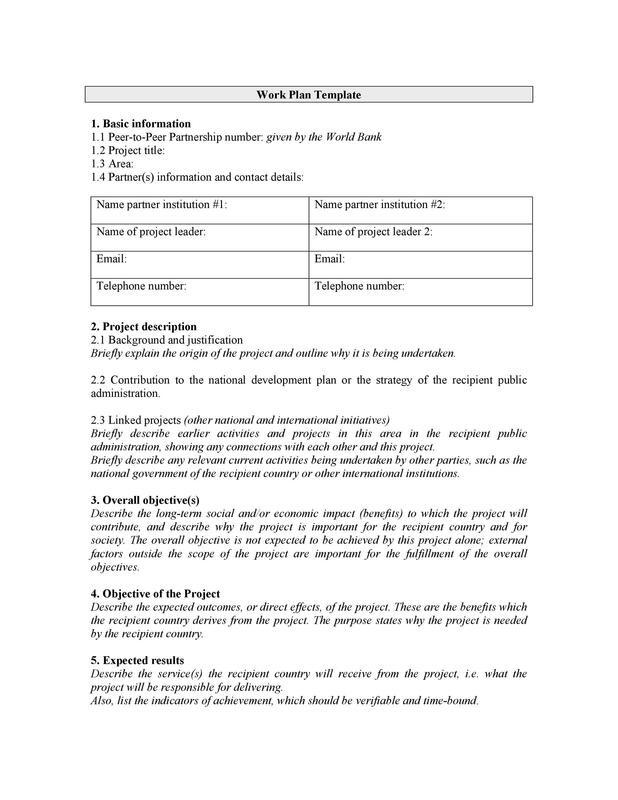 It is basically a brief overview of your project and the reasons why the plan was created. It’s important to keep this part short but interesting to encourage the readers to continue on reading. The plan should also contain the key issues, which should have already been established before the project or the plan is created. 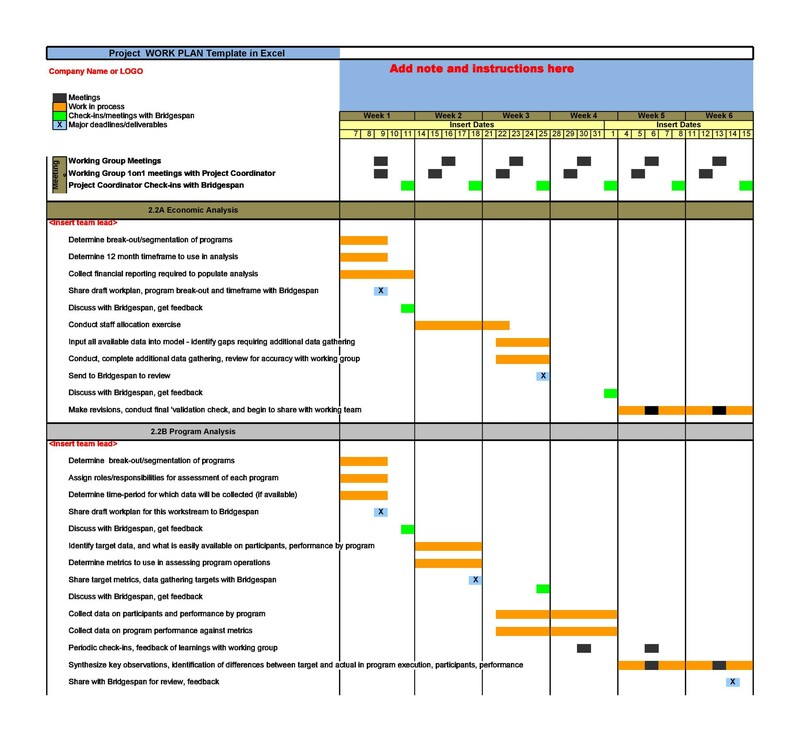 These important issues are usually determined at the assessment phase of your project. 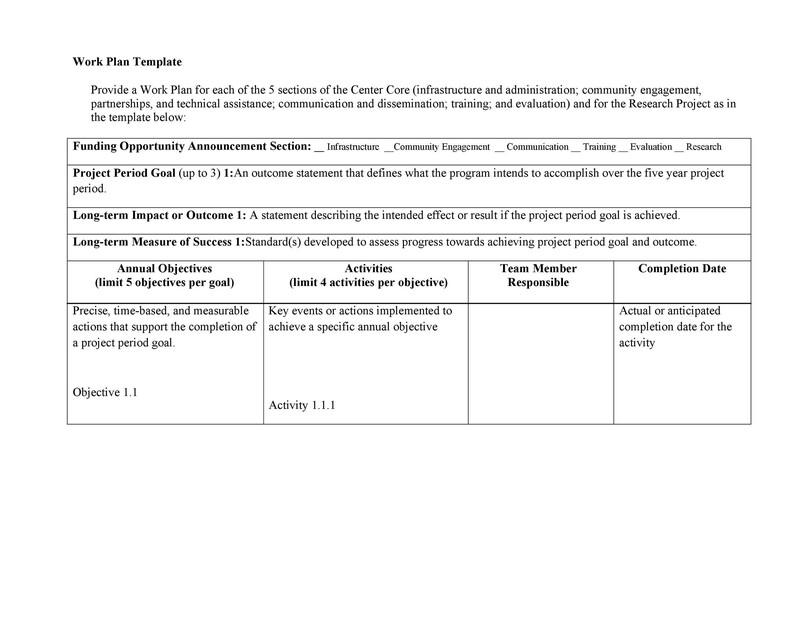 Of course, the objectives and goals of your project should be included in your plan. Without these, your plan would not be very effective and if it’s part of a proposal, it might not be approved. 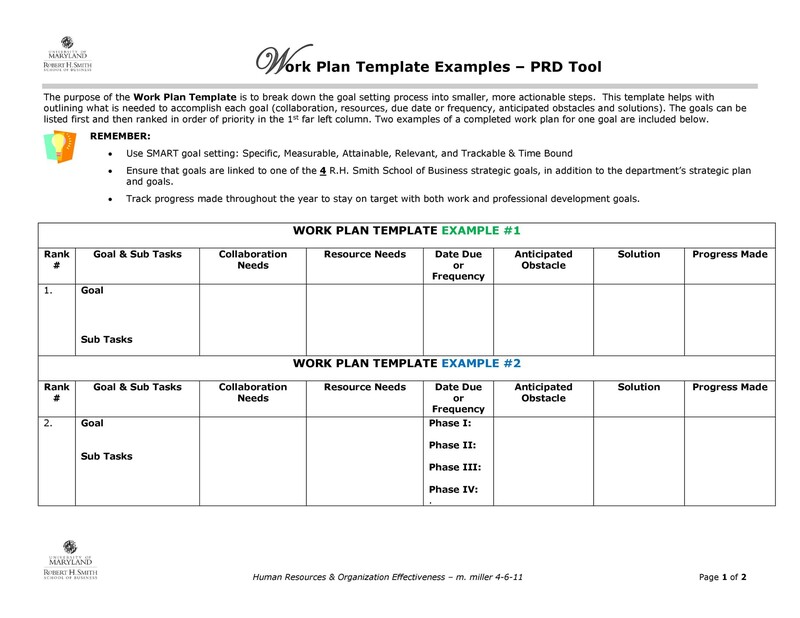 Establish the key strategies you are planning to employ to complete your project. This, along with the milestones, should be included so that the readers would know the direction of your project and what would be needed to complete it. You should include an estimated budget as well as a list of all the resources you would need for all the tasks and activities which are included in your budget. This is especially important if you are planning to present your plan to potential investors. 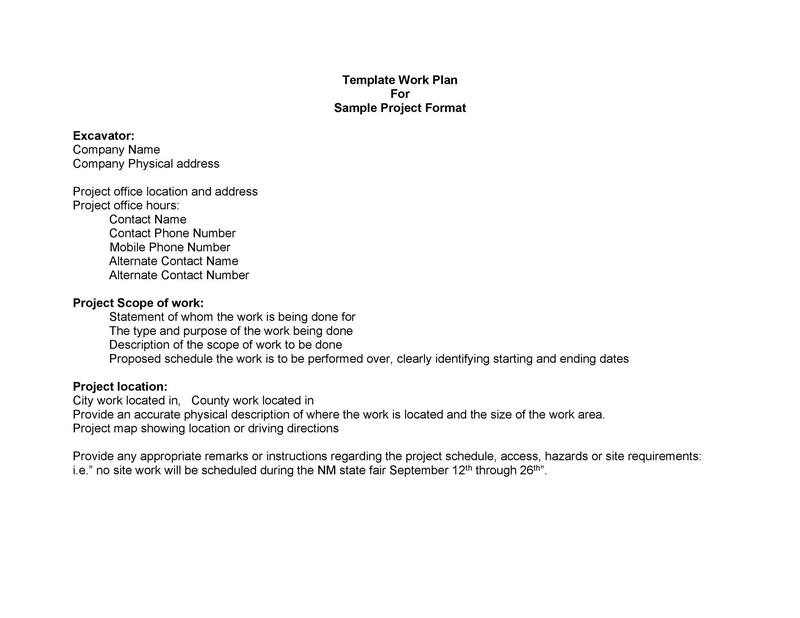 Finally, your plan should have a schedule or timeline which would define how much time would be needed to complete the project. These are the basic components which should be included no matter what type of plan you choose to make. 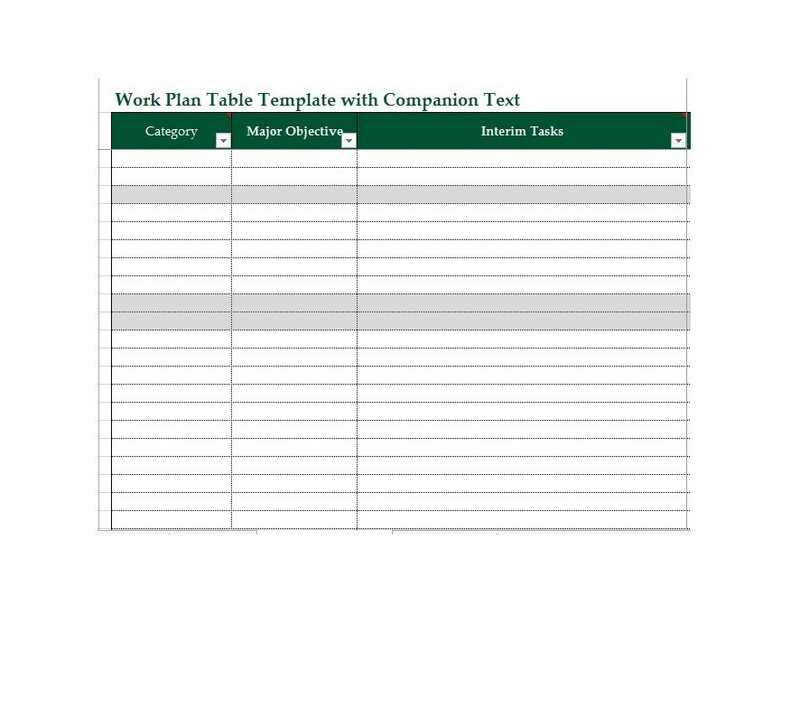 Now let’s see how you would make your own work plan template with Excel or other software. Before anything else, you’d have to establish the whole purpose of your plan since they are generally created for different reasons. 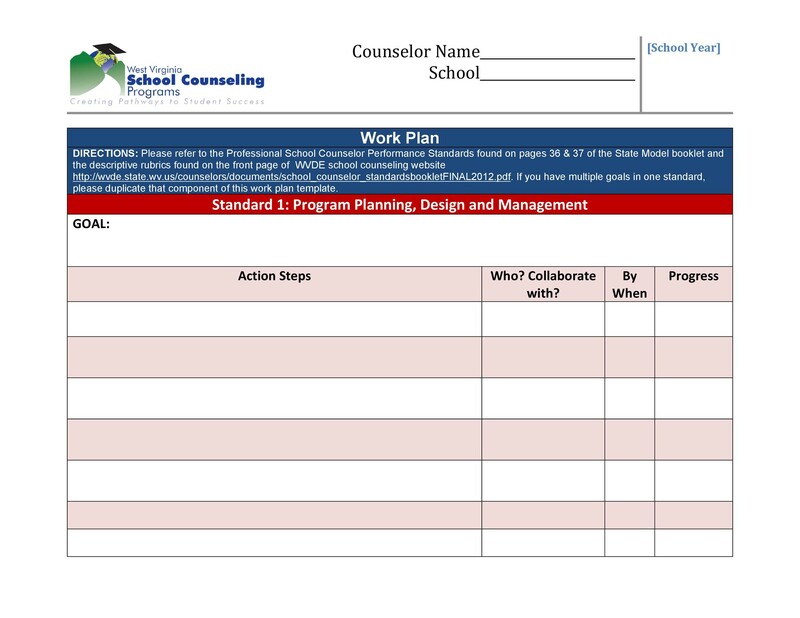 When you’re making a personal plan, you’d be able to specify all the tasks you are to do to be able to achieve your intended goals. 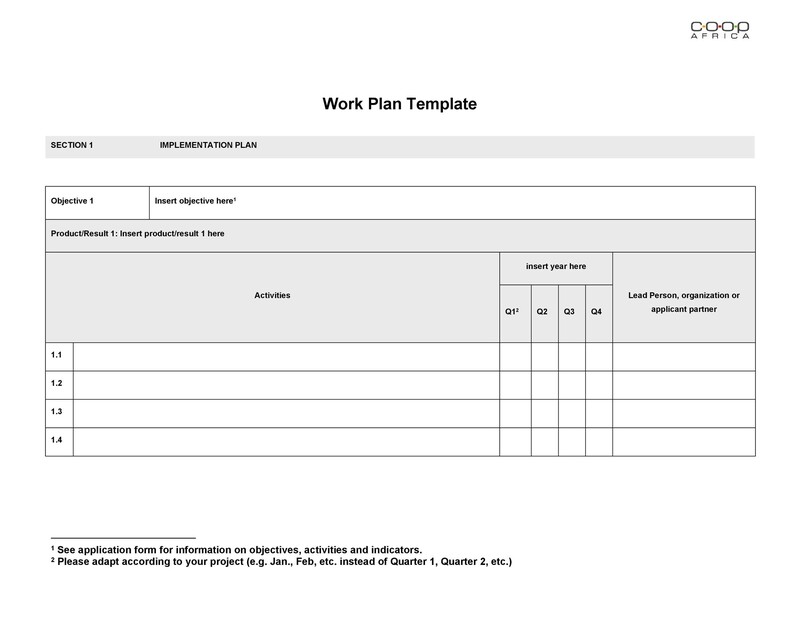 When making one for the workplace, it would help your immediate supervisor and the higher ranking employees be in the know in terms of what projects you will be working on for a specific period of time. 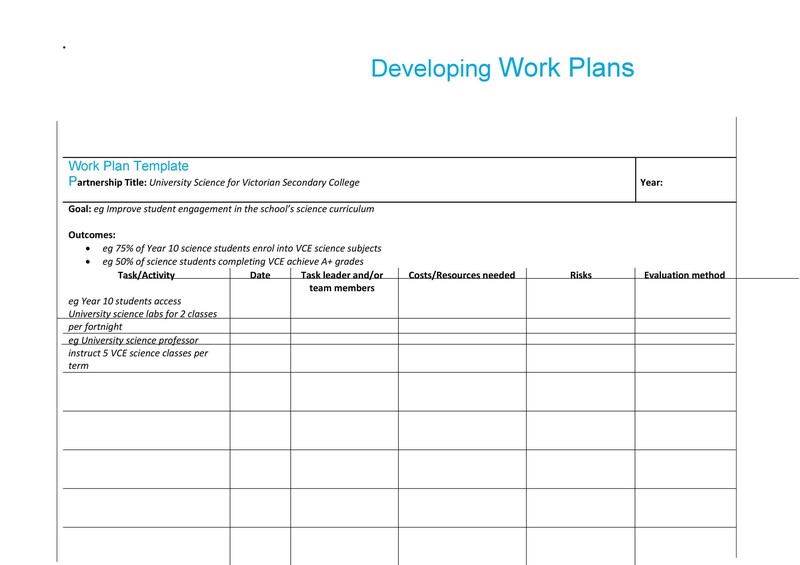 When making one for academic purposes, you’d be able to make such a plan to schedule all your activities when working on a bigger project. 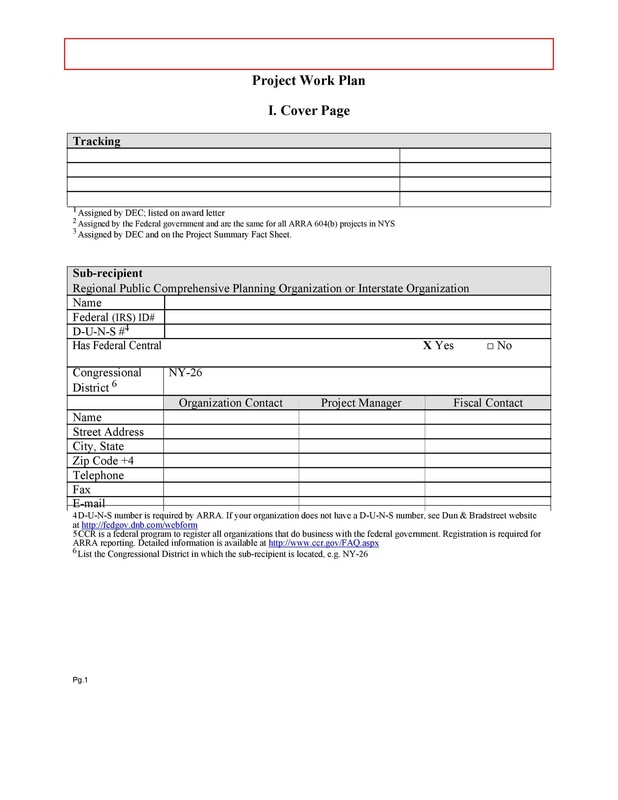 Begin by writing the background and the introduction of your project. 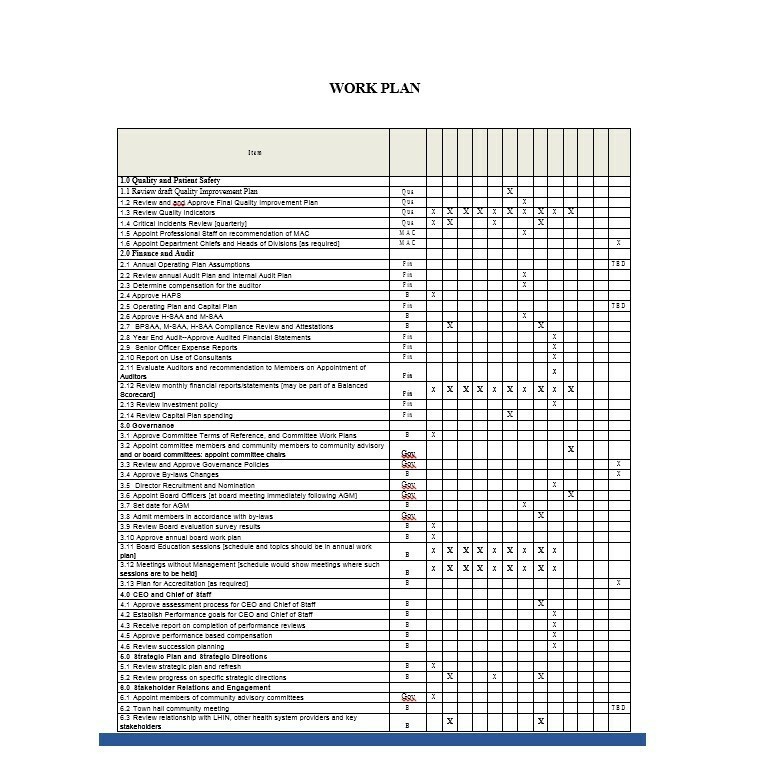 These parts are necessary for professional plans but may not be needed for other types. The introduction of your plan should be brief but interesting. 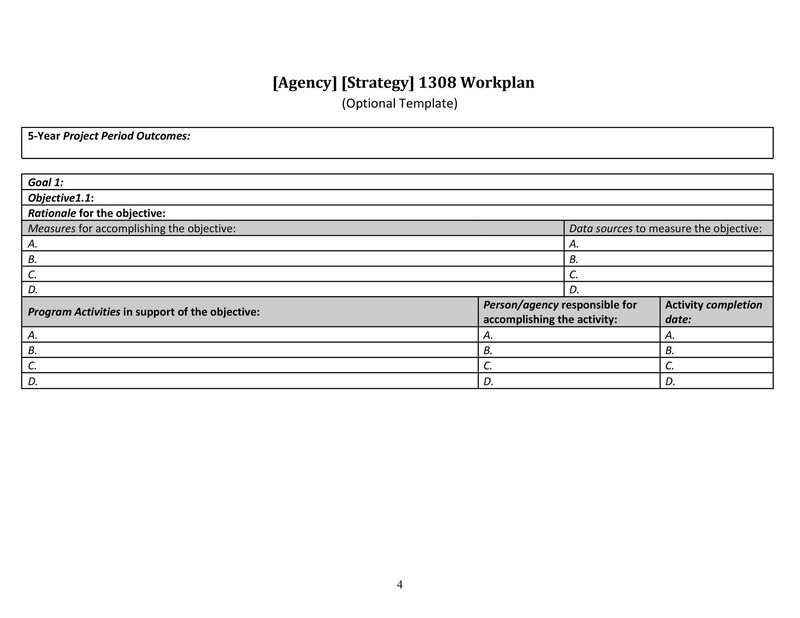 You would be using this part to explain why you are creating the plan. You’d have to introduce the projects which you will be working on during the time frame you had set. 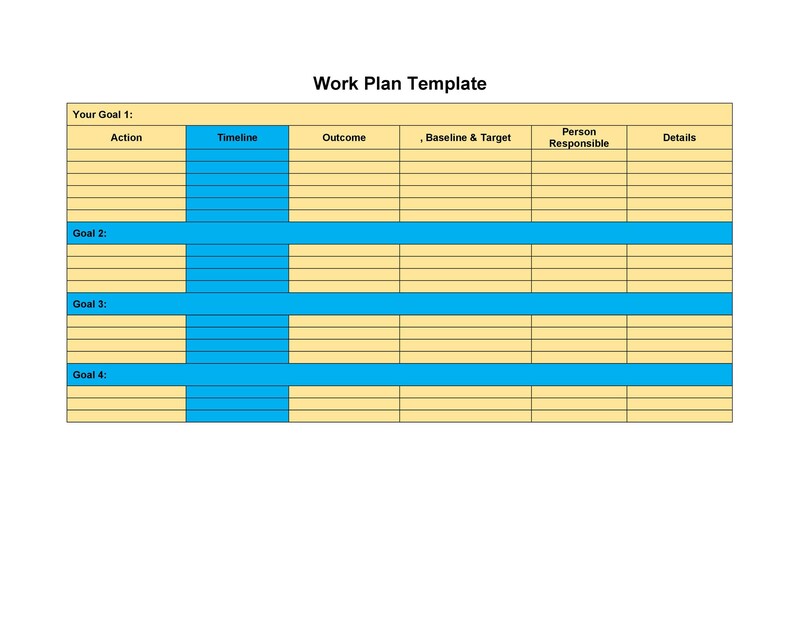 The background, on the other hand, would place emphasis on the reasons why you are creating the plan. Some information you can include here would be concerns or issues which need to be solved based on statistics or other relevant data. 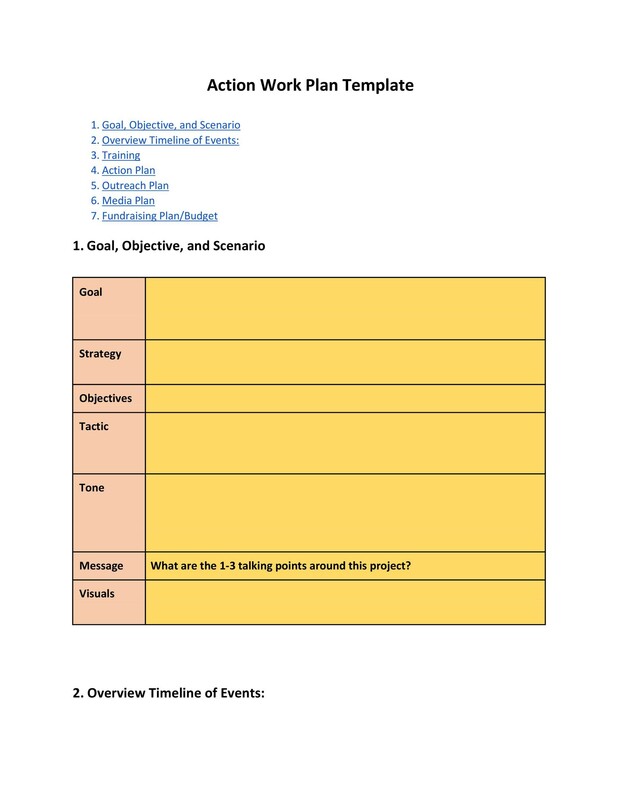 Establish the goals and objectives you would like to achieve at the end of your project. Goals are more general while objectives are more specific so you should include them both in your plan. 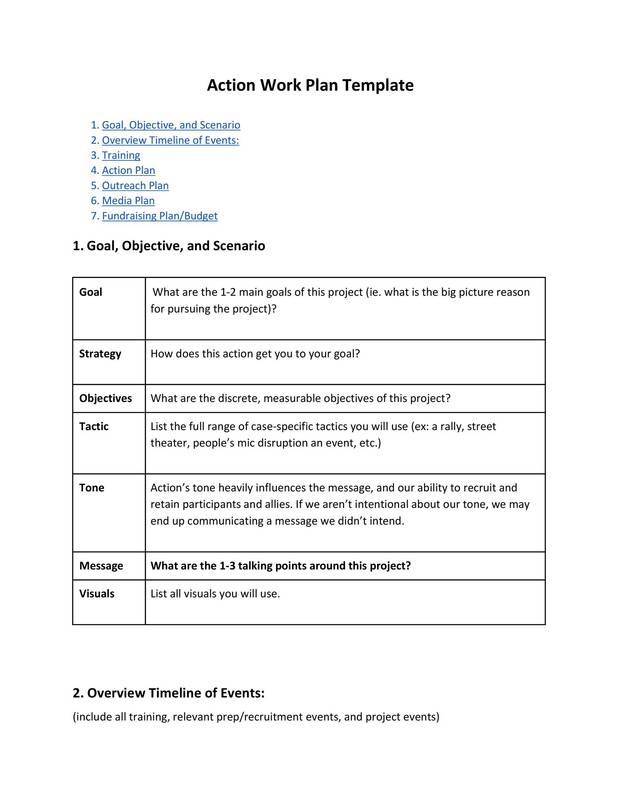 Goals are typically focused on the “big picture” so you should be writing down the expected outcome of your whole project. While the objectives should be specific and substantial. 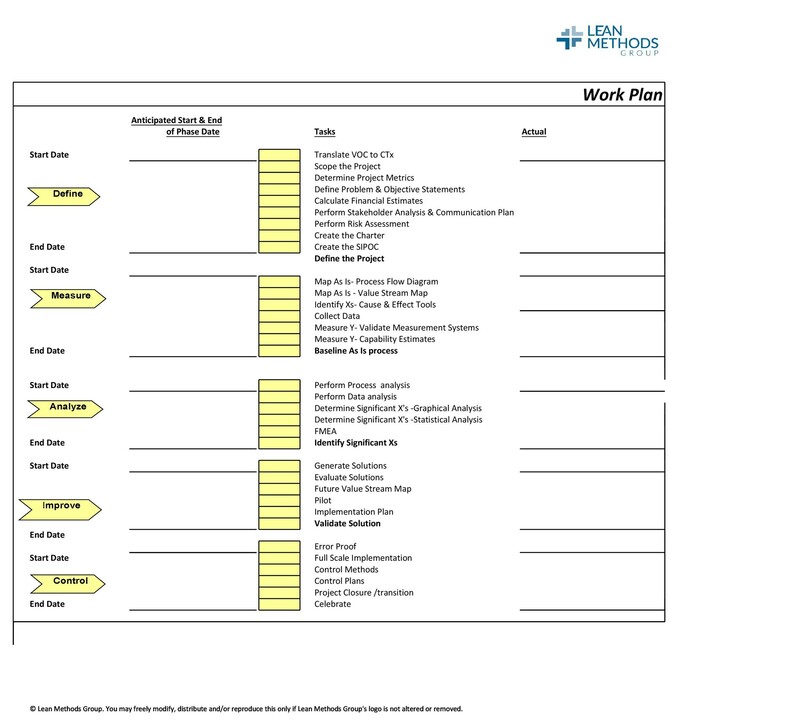 This means that as you are going through the project, you’d be able to tick them off as you complete them. 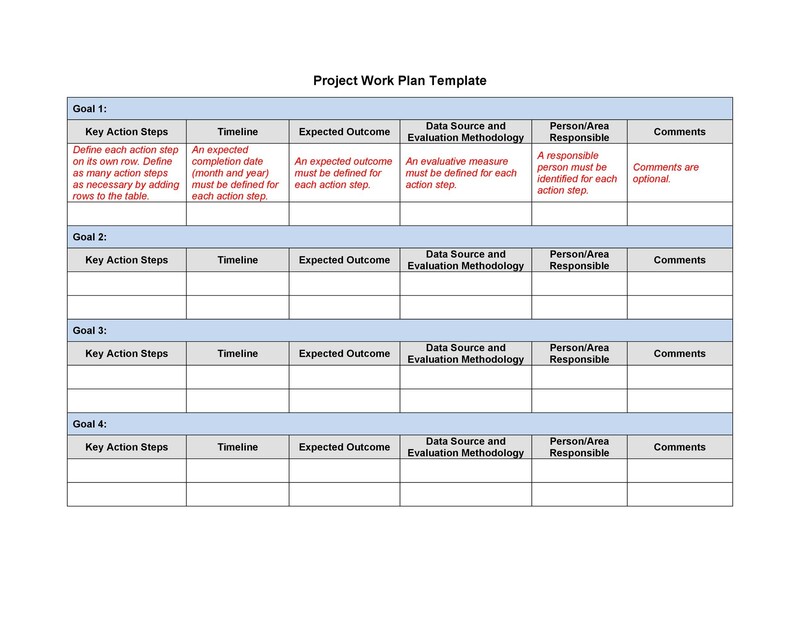 You can even choose to break down the objectives of your project work plan template into short-term, middle-term and long-term objectives if they have significant differences. When writing them, it would be helpful to use action words and active terms with very specific meanings such as write, plan, measure and other words which would initiate action. Specific: Establish all the specific tasks which need to be done as well as who are to accomplish them. 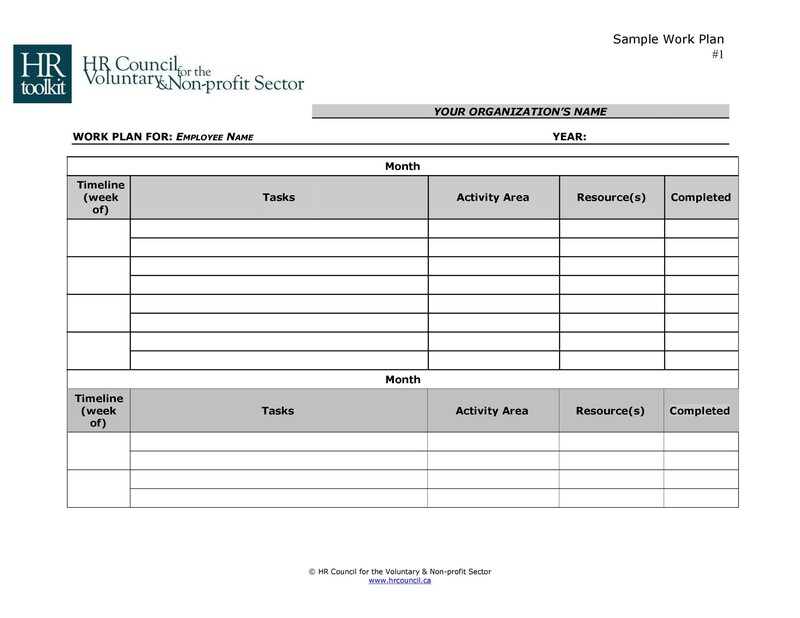 Measurable: Your tasks should be quantifiable and measurable. You should be able to count the results using statistics and other means. Remember that you would be able to be more organized and effective if you are able to concretely measure the completion of your tasks. Achievable: Your objectives should be realistic, which means you would be able to achieve them in the time frame you had set and with all the resources you had allotted for them. You can either do this on your own if you are very knowledgeable or you could actually consult with an expert to analyze if your objectives are achievable. Relevant: Your objectives should work towards reaching your goal, which is more general. The relationship between your goals and objectives should be significant so that you will be able to complete your project at the right time. Time Bound: Keep in mind that your objectives must be done within a specific amount of time. You cannot make objectives which would take too long to accomplish if your whole project has a specific time frame. So if you need to, break down the objectives or make them more specific, as needed. 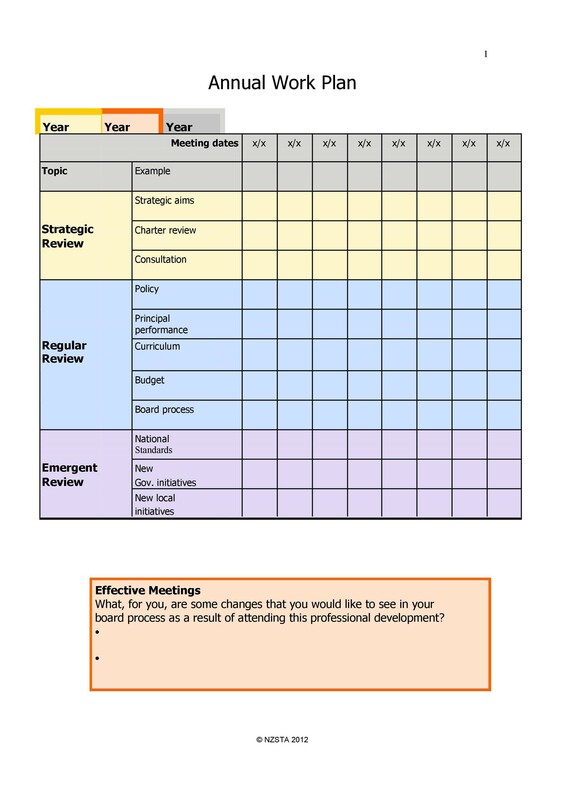 Make a list of all your available resources and all the resources you need for your project. These resources would be different and would depend on the purpose of the plan you are making. Just be sure to include everything which is necessary for you to achieve your objectives and goals. The resources would also vary depending on the type of plan you would make – plans for the workplace may include the budget, the manpower, facilities and such while an academic plan could include books, newspapers and other relevant research materials. Establish any and all constraints or limitations which you think you would encounter throughout the course of your project. These constraints and limitations are any complications which may get in your way as you are trying to accomplish your objectives and achieve your goals. Brainstorm on all these so you are prepared in case they do occur. You may ask other people to help you think about these constraints so you can come up with a complete list. Be sure to establish accountability in your plan. This is very important when you are creating a plan as you would have to designate tasks to specific individuals or teams. The people you have assigned to the tasks should be aware that they are accountable and would be responsible should anything go wrong. 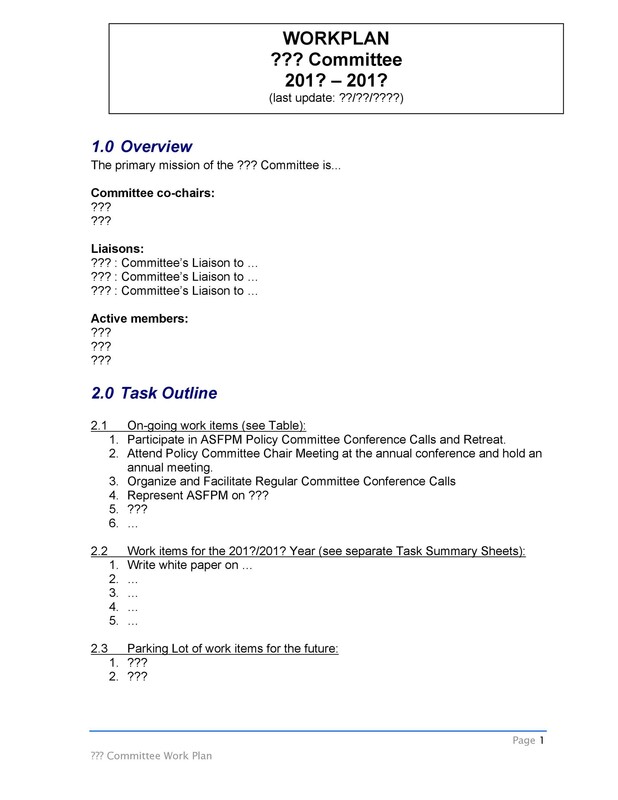 They should also make sure that the tasks are completed within the specified time frame. Create your strategy or plan of action. Go through and review your plan and decide how you would be using your resources and how you plan to overcome any limitations or constraints so you can achieve your objectives and goals. 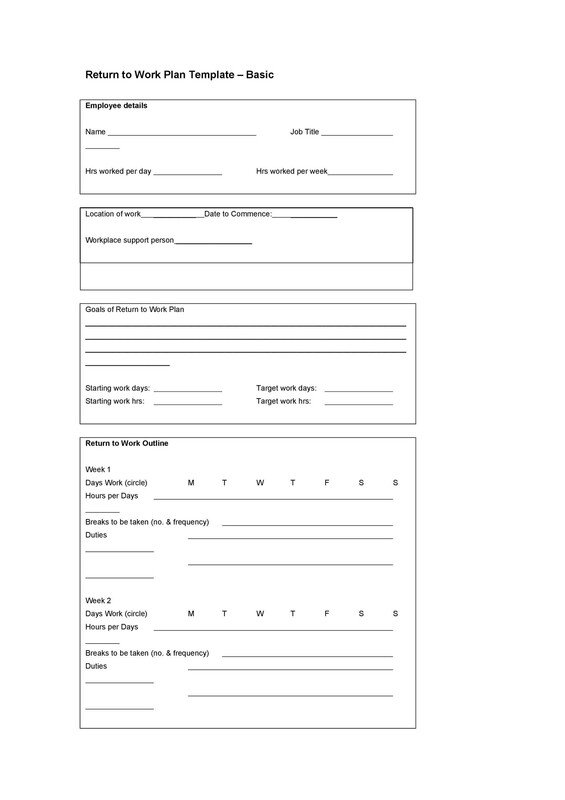 Make a list of very specific steps of action. If needed, identify all the activities or tasks which need to happen each day or each week so that you will be able to accomplish your objectives. Also, make sure to list the action steps which other people in the team would need to take. Make sure all the information is organized and easy to understand. Make a schedule for your plan but keep an open mind. 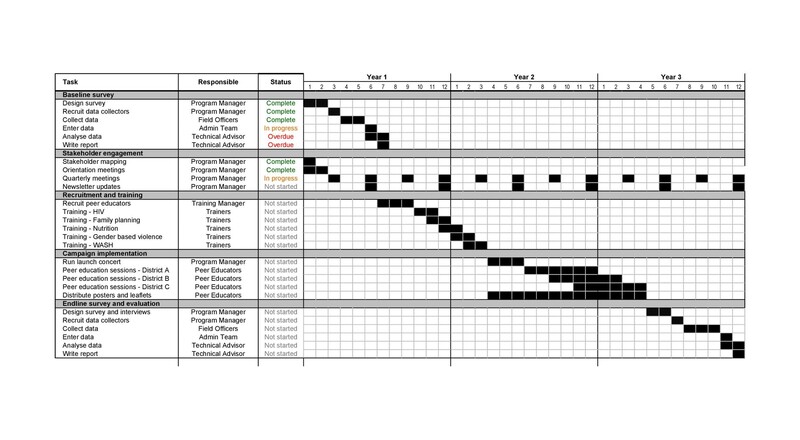 You may have made a very efficient schedule but remember that you may encounter unexpected occurrences so you can include some spaces in your schedule to make up for such constraints to avoid the delay of the whole project.